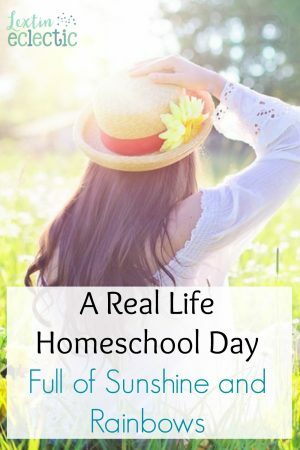 Do you love getting an inside peek into the day of another homeschool family? I do! I love reading about the realities of homeschooling and knowing that I’m not alone. Homeschooling is both beautiful and messy; abundantly blessed and abysmally hard. Well, read on about one of my wonderful homeschool days. Great days do happen! It is possible! And this day was even a Monday, what are the odds of that? Here’s a peek at my day with my little students – Curly (age 11 in 5th grade), Tiger (age 9 in 3rd grade), Bee (age 7 in 2nd grade), Ladybug (age 6 in Kindergarten), Punkin (age 4 in Preschool), and a baby thrown in just for fun. 6:30 – I arrived in our basement and was greeted by the sight of Tiger (9) and Bee (7), playing on the rug. They both informed me that they had already walked on the treadmill AND done their independent work. Amazing! I discovered that Curly (11) was not awake yet, so I sent them upstairs to find her. This was a rarity for my usually punctual child. 6:40 – Curly (11) stumbled downstairs in a terrible mood because she accidentally overslept. We had a little attitude adjustment chat, and then worked on some of her schoolwork together. We were able to get through a couple of her subjects before I decided she would work best alone for a time. Her attitude was still a little bit, um, awful. 7:00 – I sent Curly (11) off to work on her independent work while I began working with Bee (7). She was in a great mood and didn’t even argue during math or spelling or reading. She didn’t cry during math when I asked her to skip count by 7’s, 8’s, and then 9’s! That was a first! 8:00 – I finished all of Bee’s (7) morning schoolwork and we headed upstairs for breakfast. The girls started laundry while Tiger unloaded dishes – all without any reminders from me. I got all the little girls up and to the table. 8:30 – After our breakfast of oatmeal (which Curly made by herself), and our AWANA verse practice, we did a quick kitchen clean up before reading time. 8:45 – Curly (11) read to Tiger (9) while Bee (7) read to Ladybug (6) and Punkin (4). 9:00 – I worked with Ladybug (6) on her school. We had a little chat about good attitudes before we got started. Apparently the chat helped because we breezed through math and reading before logic, poetry, and history. During this time Curly (11) read to Bee (7) and then Bee and Tiger (9) practiced piano. Punkin (4) played with the baby and the dog while I worked with Ladybug (6). 10:00 – Curly (11) worked on independent work and then practiced piano while I did morning school with Tiger (9). He was actually cheerful during our school time, aced his math homework and sped through reading and spelling. Who is this child? The littlest girls played together (without fighting) and the baby went down for a morning nap (without fussing). 11:30 – Tiger (9) was done with school and took a break to go play with Bee (7). I had a few more things to do with Curly (11) since our early morning time was cut short. She was in a much better mood after getting her other independent work done though! 11:45 – We were able to gather around my comfy gray chair and do our Bible lesson before lunch after Tiger (9) got the baby up from her nap. It was a great “circle time” with the baby cheerfully playing on the floor while we read Bible together. We often have to talk over her loud screeching and talking. 12:00 – The kids worked on Veritas history on the computer while I got lunch on the table. Love that they can be learning while I take a little break to get things done! 12:45 – We trooped back to the homeschool room for some group school with history and science readings. I read while the kids colored. No one fought over the markers or the coloring books! 1:15 – I worked on Spanish with Ladybug (6), Tiger (9), and Bee (7) while Curly (11) helped Punkin (4) clean up all the markers and crayons. Punkin actually cooperated which is rare for her right now! 1:30 – Curly (11) read to Ladybug (6) and Punkin (4) and then listened to Ladybug’s short piano practice. I read to Bee (7) and Tiger (9) while the baby crawled all over them. 2:00 – School was done and it was time for me to take a short break. The kids had a few chores to do and a little “homework” to complete, but then they were free to play. They chose to play in the backyard since the day was beautiful. I headed upstairs and had time to work on my Bible study, blog, and then read after I got the baby down for her afternoon nap. I was so ready for my quiet time! 4:00 – It was time for a few more chores. Then I started dinner prep, so we could make it out the door to swim team practice in time. The day was nearly perfect. Everything was wonderfully on schedule despite our rocky start. The kids were in good moods – they listened well and cheerfully did all their school work. They were even getting along during their reading times and being helpful to each other. I was slightly afraid that they had been replaced by Stepford children. I mean, how often are they all in a good mood on the same day? It was kind of scary! You can have eager learners and cheerful chore-doers! It happens, I don’t know, maybe once a year? But days like today are the ones that make me feel so blessed to homeschool. Seeing my kids working and learning together validates our homeschool decision and motivates me to keep pressing forward. Have you had any wonderfully refreshing homeschool days lately? Write it down! Remember it. Bask in the togetherness and the shared learning. Use it as motivation to keep going, because sometimes the next day can be as awful as that day was wonderful. How do I know? Because the Tuesday after that particular Monday was a horrible homeschool day! I’ll be sharing about my terrible Tuesday soon. I have a feeling you’ll be able to relate! In the meantime, if you’re wanting to read about more of our homeschool days you can read about homeschooling while pregnant. Whew! Now that is exhausting! Ohh, and yes, I do start my homeschool day incredibly early. You can read more about why we love our early morning start time right here! Haha! Yep, it’s not always easy to get all the kids in a good mood on the same day! Yes! I love when we have days that flow well. It’s so encouraging!